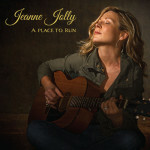 Raleigh, NC singer-songwriter Jeanne Jolly has a voice that you could only be born with. A naturally rich instrument whose nuances were brought out – rather than boxed – through classical voice training. There’s nothing mannered in her expression as she soars through the eight new recordings – and seven original songs – of her latest solo release. Produced by her longtime collaborator Chris Boerner and self-released on Jolly’s Ramblewood imprint, the album shows the sort of care and sophistication one can layer into projects that don’t have a major label’s commercial ambitions loitering in the control room. The eight-piece studio band includes pedal steel player Allyn Jones, keyboardist James Wallace, Bon Iver drummer Matt McCaughan, and Megafun’s Phil and Brad Cook. Together they explore country, soul, and even a bit of Memphis with the horn chart and solace of “Gypsy Skin.” Jolly’s vocals reach past the notes (which for someone of her abilities, are table stakes) to hit every emotion dead center. She soars from intimacy to strength in a single note as she wrestles with the fatalism of “California” and declares her need on “Boundless Love.” The latter’s soulful background vocals – all supplied by Jolly – are particularly mesmerizing. This entry was posted on Saturday, November 14th, 2015 at 8:47 am	and is filed under CD Review, Free Stream. You can follow any responses to this entry through the RSS 2.0 feed. Both comments and pings are currently closed.